Book Review: Jonathan Livingston Seagull | OFF KLTR! This post is dedicated to my father, who (despite our passionately opposing views on education!) I love and respect with all my heart. Earlier this winter, I reviewed Illusions: The Adventures of a Reluctant Messiah by Richard Bach. I LOVED IT! 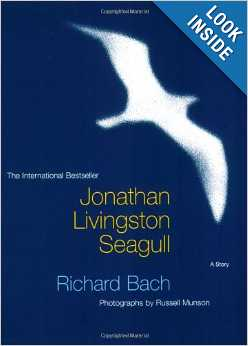 And the same author wrote another book that I also LOVED called Jonathan Livingston Seagull. “Most gulls don’t bother to learn more than the simplest facts of flight–how to get from shore to food and back again,” writes author Richard Bach in this allegory about a unique bird named Jonathan Livingston Seagull. “For most gulls it is not flying that matters, but eating. For this gull, though, it was not eating that mattered, but flight.” Flight is indeed the metaphor that makes the story soar. Ultimately this is a fable about the importance of seeking a higher purpose in life, even if your flock, tribe, or neighborhood finds your ambition threatening. (At one point our beloved gull is even banished from his flock.) By not compromising his higher vision, Jonathan gets the ultimate payoff: transcendence. Ultimately, he learns the meaning of love and kindness. …This is a spirituality classic, and an especially engaging parable for adolescents. So Jonathon Livingston Seagull has a fairly similar lesson to Illusions. BUT what I think makes this book easier to digest is the fact that it is about seagulls. It seems easier to learn a lesson through animals – for grown ups as well as children. I feel this way about some adoption books for children as well. Like Our Twitchy, for example. The story is about a horse and cow that adopt a bunny. That “difference” feels totally safe. Whereas a story about a two Caucasian parents adopting an Asian baby feels less safe. Anyway…the book made me feel better about our (seemingly countless) conscious decisions to go against the current cultural norm – from rejecting formal schooling in favor of an unschooling lifestyle to our belief in alternative medicine. But just when I am feeling like I have things under control, something new pops up! Right around the time that I was reading Jonathon Livingston Seagull, I learned about this language program in North Cambridge called LEX (Institute for Language Experiment, Experience, and Exchange). The principle blows my mind. I don’t even totally understand the program, but the model seems to be that you learn multiple languages at family play groups and listening to language CDs at home. It just sounds too good to be true. And in truth, I want to dig my heals in and say IT CANNOT BE TRUE! IF IT IS TRUE, WHY THE F*** DID I SPEND SO MANY YEARS STUDYING SPANISH?! WHY DID I SPEND ALL THAT TIME AND MONEY GETTING CERTIFIED TO TEACH SPANISH? COULD I HAVE TAUGHT ALL OF MY FORMER STUDENTS IN A BETTER, MORE EFFECTIVE WAY? But wait! This is actually a huge lesson for me. In learning about a possible way to learn multiple languages quickly and easily, I don’t WANT to believe it’s true because it might mean that something that I’ve already done was unnecessary. I don’t WANT to believe it…huh. I have an MAT (18 month commitment) and 3 years of teaching experience. My grand total investment in teaching is under 5 years. This is so helpful in understanding how wholly invested life-long teachers and administrators are in the current educational system. Teachers dedicate their lives to improving the lives of their students. They work tirelessly in a broken system. It’s logical for a life-long teacher to hold strong to their commitment to public education. And medical doctors. Doctors go into medicine with the intention of improving – and even saving – their patients’ lives. Their training is incredibly long and difficult and expensive. The idea that acupressure can fix crossed eyes is too much for a person who spent years in medical school, survived grueling residencies, and dedicated her professional life to modern medicine. They don’t WANT to believe in alternative medicine. I wrote this post quite a while ago, but something in me wasn’t ready to publish it. Well, today I figured out what I was waiting for: the talk that I just had with my dad on the phone. My dad was a dedicated, passionate special education teacher and administrator for over 30 years. I invested a mere five years into teaching and I still didn’t WANT to believe that there might be another, better way to learn multiple languages. After a career spent pouring one’s blood, sweat, and tears into our educational system, why would a teacher want to learn about alternatives to compulsory education? In a similar vein, why would a medical doctor want to learn about alternative health care? But that blocking of new ideas is the ego. That block gets us stuck in “being right”. And, as a result, we are stuck in the present, without a vision for a better future for ourselves, our children, our world. I can’t ignore this LEX program. I have to go and research it. What if it is the ultimate way to learn a language? Don’t I want to know about it? Well, yes. And in order to live fully, I have to be open to new possibilities, even when they don’t feel all that comfortable. And I know that it’s asking a lot, but what if teachers and administrators and doctors and nurses, could open their minds and their hearts to alternatives in medicine and education? What if we stopped automatically blocking alternatives to the status-quo? Well…like Jonathan Livingston Seagull, we might learn to fly – to soar even – instead of spending all of our time searching for food.